I struggled with what to name this. It’s kind of like a pancake, it’s kind of like french toast, but it’s also baked and cut up like a cake. After some reflection, I decided to not even try to equate it with existing breakfast foods and to name it something both descriptive and unique. 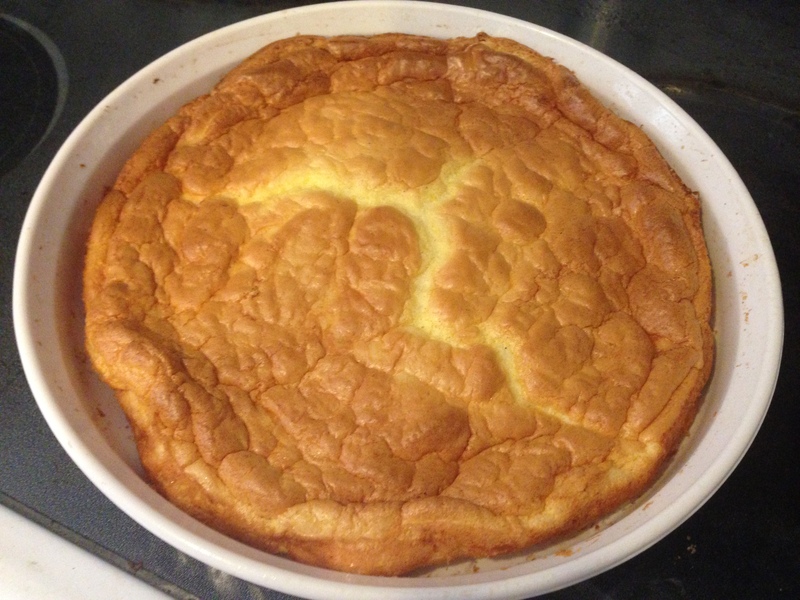 Even though it now has a unique name, it is still similar in taste and texture to both pancakes and french toast. It’s very spongy, but also moist, rich, and eggy (I don’t think eggy is a real word, but you get the idea). As an added plus, it’s baked, so you don’t have to stand over the stove for half an hour making enough for everyone. 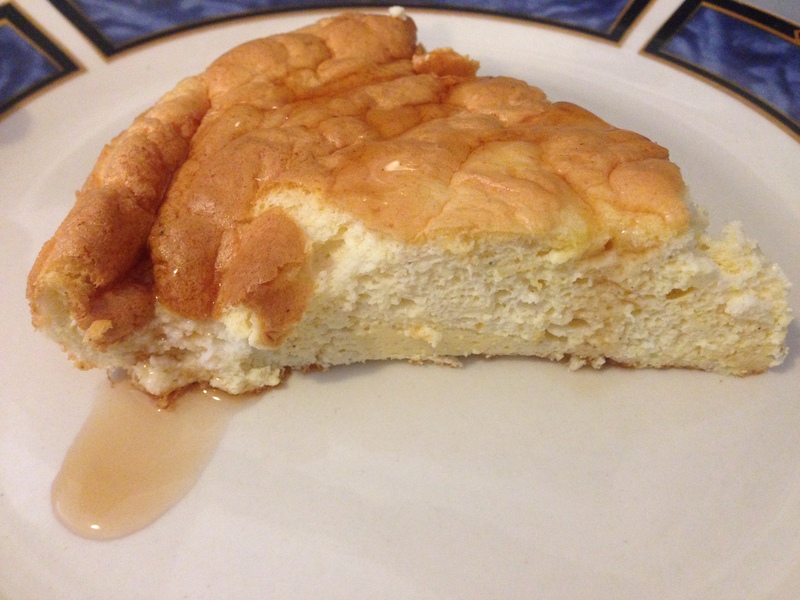 I ate it with sugar-free pancake syrup, and thought it was great. I also tried it with some caramel cheesecake pudding on top, and that was also super. It would go well with anything you’d put on pancakes or french toast, like jam, fruit and whipped cream, or powdered sugar. What you try on it will depend on your relationship with carbs, but it’s an excellent vehicle for any topping you care to try. I would feel completely comfortable serving this to guests, whether they follow a low-carb diet or not. Don’t even tell people it’s low-carb and they’ll never know the difference. 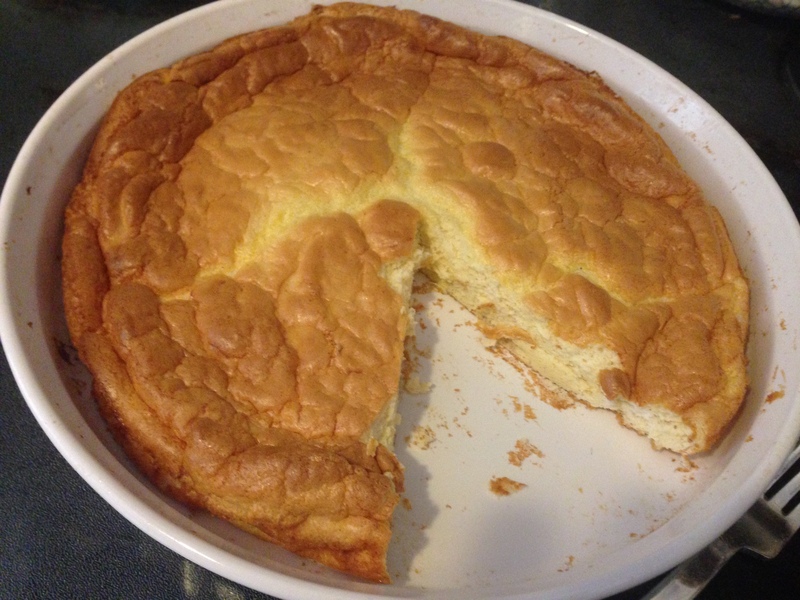 Liberally grease a shallow 9-10″ baking dish with either baking spray or butter. The spray is easy to use but the butter tastes better. The choice is up to you, as long as you coat the bottom of the dish really well. Put the softened cream cheese into a medium sized mixing bowl. Separate the eggs, putting the whites into another very clean mixing bowl, preferably metal or glass, and add the yolks to the cream cheese. Add cream of tartar to the egg whites, and add the Splenda, vanilla, salt, cinnamon, and nutmeg to the cream cheese and egg yolks. For the seasonings, I shook the salt once and the cinnamon and nutmeg twice. You could also do one pinch of salt and two pinches each of cinnamon and nutmeg. You only need a little. Whisk the egg whites until stiff peaks form. Then whisk the cream cheese and eggs yolk mixture until it is very smooth. You must do it in this order. If you forget and put the whisk in the cream cheese first, clean it thoroughly before trying to whisk the egg whites or else they will never stiffen. Put half of the stiffened egg whites into the cream cheese mixture and gently fold them in. When they are somewhat mixed, and the rest of the egg whites and gently fold the batter until it’s reasonably uniform. You want to strike a balance between well-mixed batter and not completely deflating the egg whites. Pour the batter into the prepared baking dish, smooth it out evenly, and bake for 30 minutes at 350º. It will puff up a lot while baking. 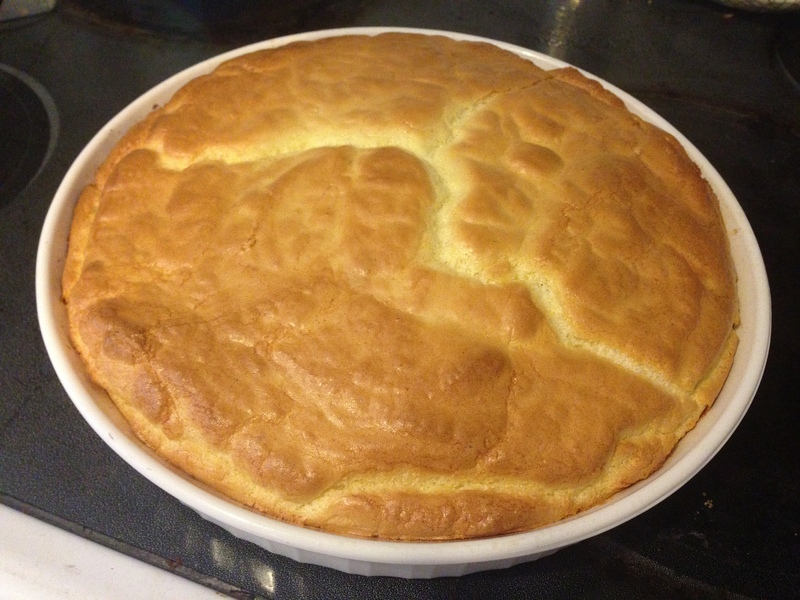 When it’s done, let it cool for a few minutes until it deflates back down. Cut into slices and serve with the topping of your choice.